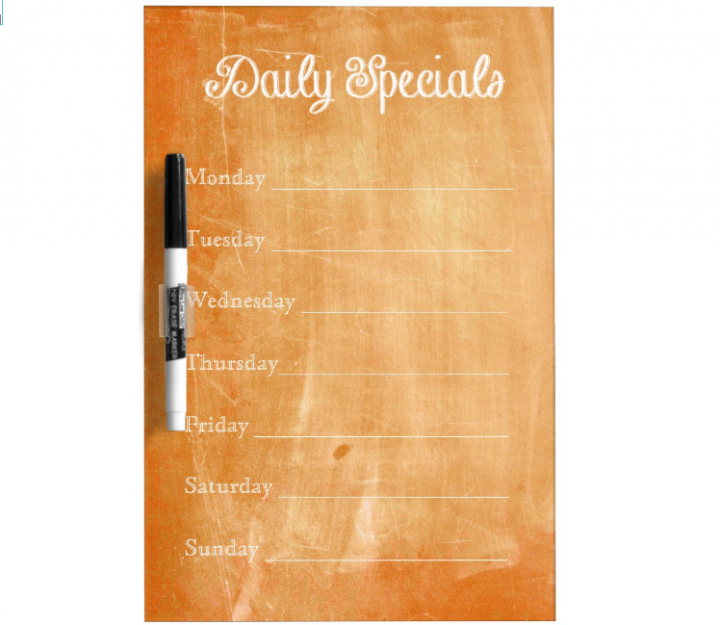 Menu templates add to the aesthetic of a restaurant. 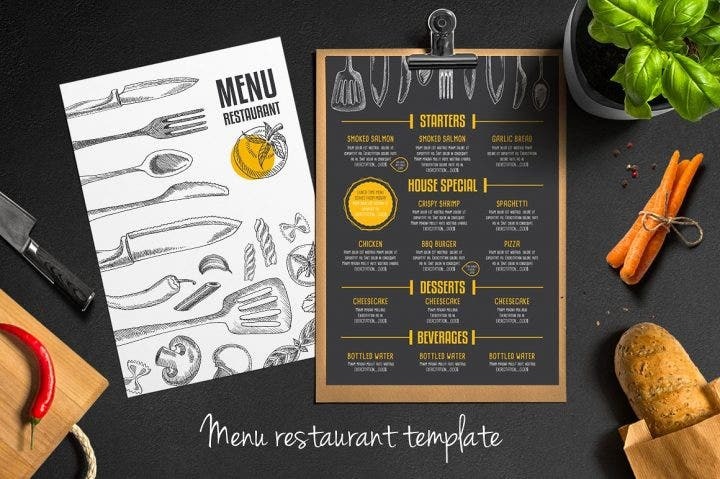 A menu can serve as the first interaction between the customer and food, so make sure these templates are designed to best fit your restaurant and customers. 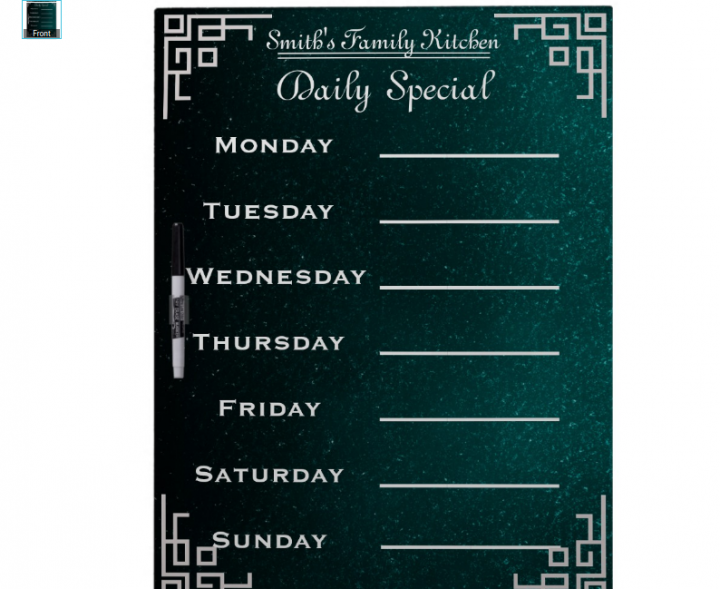 Here are 15 simple yet attractive daily menu templates. Menus can occasionally be tough to make, especially if you want to serve multiple dishes but can’t seem to decide what to actually write in your menu. This can be a dilemma if you’re a good cook or chef who knows lots of multi-cultural dishes but can’t find the balance between what you really want to cook and what your target market really wants to eat. If you’re a startup and haven’t really decided on what signature dish to cook, offering dishes from different cultures will help your restaurant offer more variety, making loyal customers come back and invite new to your establishment. It takes time to build up a loyal customer base or a mega food franchise like McDonald’s, so be sure to offer daily specials in your menu. Try to experiment serving different kinds of entrees and see how customers react to them. The more they order certain dishes, the more you can see which ones are more popular and try to serve those up more frequently. 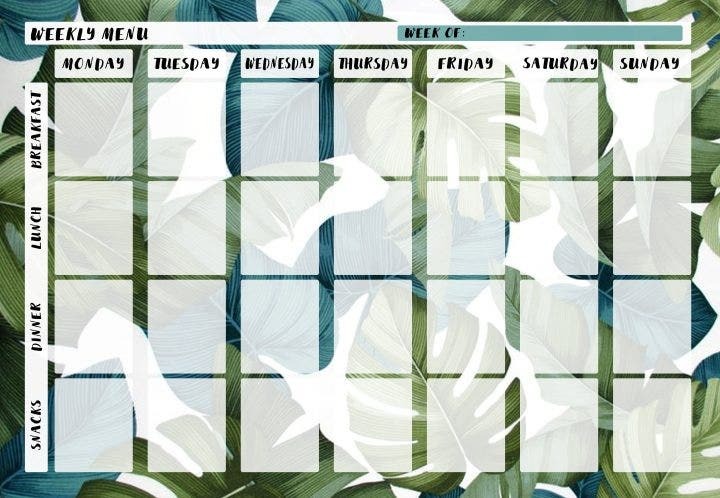 This light blue plain menu template shows a simple light blue-colored background with dark bold vertical lines separating each day of the week. 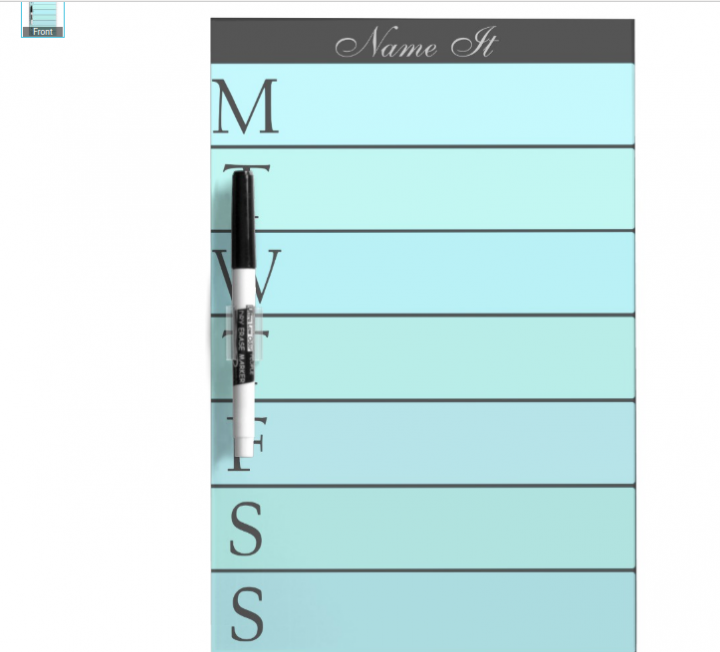 The pen on the left side of the template is another added design element. This template has a clean design that doesn’t show much and is intended to directly inform the customer. The name of the dishes written on the menu will elevate the template, especially if it’s written in calligraphy. Additionally, pictures of dishes instead of names are also a good alternative. They will spark the customer’s interest and, due to their visual appeal, they will probably get more orders. This is another plain menu template with a white-colored background and multi-colored boxes. Using white as the central color of any design can be dull especially if its paired with black, but it can still impress depending on how it’s made. 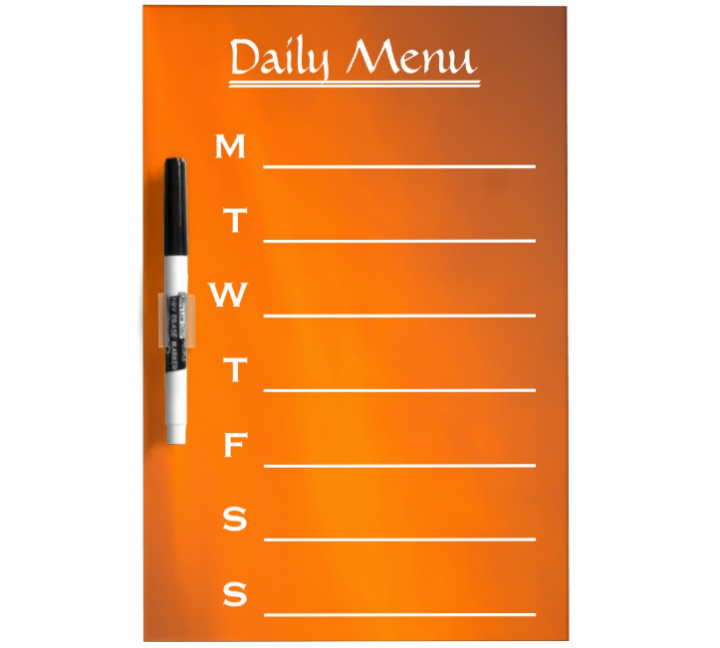 This daily white menu template is simple and places emphasis on the name of the dish rather on the menu itself. The bright green heading as well as the bright colored boxes completes the design template. The blue, green, yellow, orange and red colors add another layer to the template and prevents it from becoming boring. This daily menu template is different compared to the first two templates as it provides some nice designs despite its black and white theme. The circles resemble polka dots but with added gradients in the circle designs. The circles add a visual touch that was missing from the first two templates. This template can be used for restaurants offering moderately priced to expensive alcoholic drinks, and also for restobars. This daily menu template adds some nice orange gradients in the design. The orange gradient provides the backdrop of the template. Gradients always add to the aesthetic of any design, especially to menus. The single color is transformed with both lighter and darker shades. The gradient can also be transformed into different shapes. Although gradients look amazing, there are limitations on how they are used. Just like in each design, gradients depend on the purpose of the design. There are specific colors that fit each gradient. For example, red gradients look better in designs for Valentine parties than in designs for weddings. Different colored gradients used in a single design are rarely used as they over complicate the final product. Gradient use especially in company logos have decreased the past few years as companies shift to a more “flat design” in their logos like Google, Microsoft, and Pepsi. There are still some notable companies that integrate gradients in their companies like Airbnb and BMW. Chalkboard designs have been very popular the past few years. 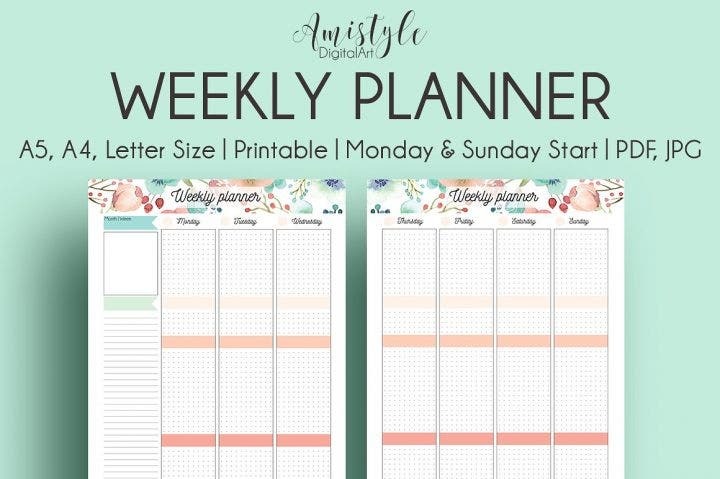 The design is versatile and can be used for any occasion such as weddings, birthday parties, retirement parties, baby showers, and the like. 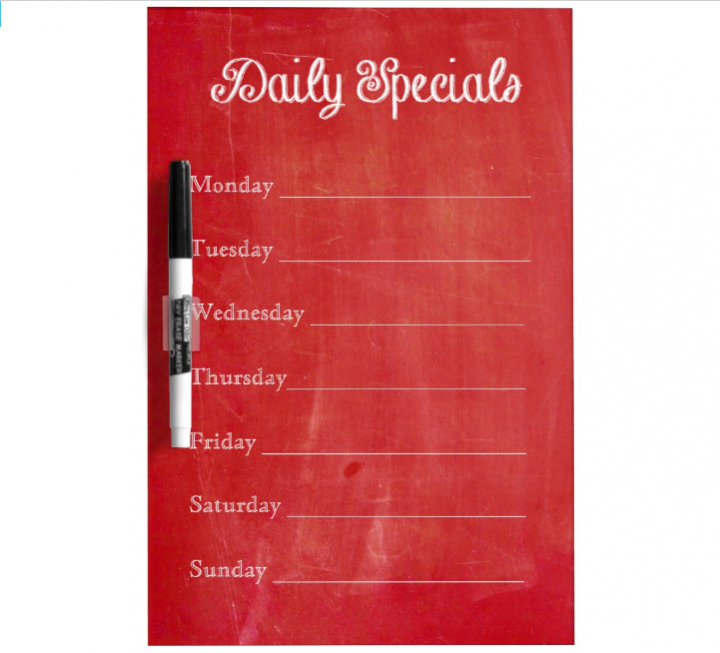 The next few images will show some attractive daily menu chalkboard designs. 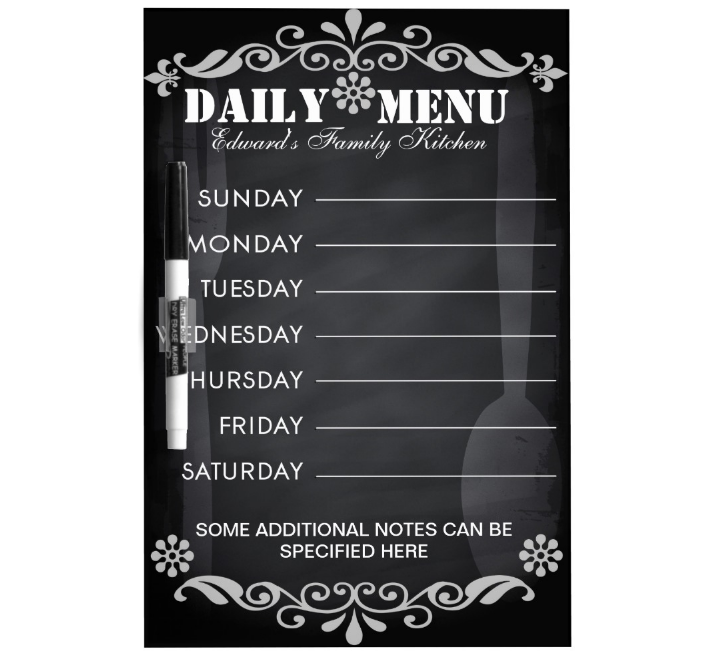 This menu chalkboard design template has a large spoon and fork situated in the background. The utensils have ghostly looking effects due to its low opacity. It looks better than an actual spoon and fork image or spoon and fork icons. The utensils complement the black background and the flower borders on the upper and lower sides of the template. This chalkboard design is similar to the one pictured above, but instead of a single spoon and fork pair, a number of spoons, forks and knives are sketched using chalk. The assortment of utensils are placed on the upper corner of the menu template. Aside from the flower-inspired borders, this chalkboard design resembles a true classroom chalkboard with its black chalkboard and chalk art. Numerous chalkboard designs are based from this template due to its simple yet beautiful presentation. Real black chalkboards can be seen everywhere, but they’re not the only colored chalkboards. Green is another popular chalkboard color. The red and orange chalkboards you can see here unfortunately don’t exist in real life. But it proves that any chalkboard color can be created and produce the same visual results. The red chalkboard design template resembles the red meat color and can be used in restaurants specializing in pork and beef dishes or even burger and hotdog joints. 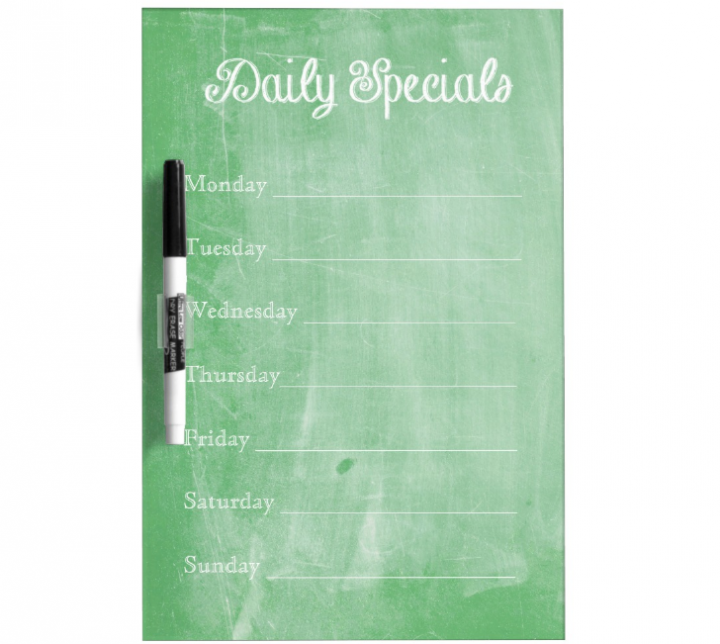 The green chalkboard design template is best suited for salad shops but also can be used in other restaurants. The orange chalkboard design template radiates energy due to its orange color, as such it can be used for themed cafes selling sandwiches and shakes. The flower designs in the background add a nice touch to this green chalkboard design template. Aside from using the regular green chalkboard, an added aesthetic is seen through the flower designs. Two star, three star, or five star restaurants and all other formal restaurants which require dress codes are best suited for this beautiful template. Prefer to use simple menu templates. This is very important as you don’t want to engage in some trickery with your customers. For example, you have a highly detailed and effects-filled template yet you only serve rice meals which only cost $2 dollars. 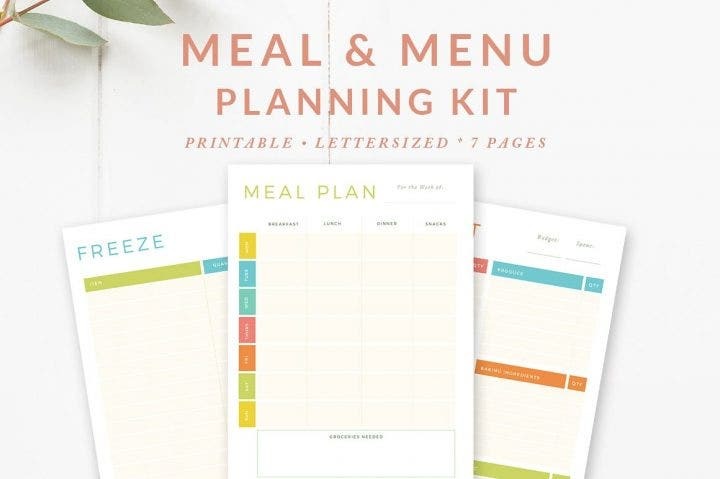 Simple menu templates have a better overall look despite their clean and simple designs. Also, add some images of food in your menu to make it more appealing. Highlight the best sellers. Your best selling dishes are the ones earning money for your restaurant, so give them great importance and highlight them in any way you can. For example, you can use bigger text for the best sellers. Also, add some descriptive text to your best sellers to make customers excited (for example, “Our signature rib eye steak with corn and gravy will take on you on a trip to food paradise! See you on Friday!”). Don’t leave out some empty dates. It’s called a daily menu since you are serving something every day. It doesn’t matter if you repeat some dishes during the week as long as you have something written in your menu. Indicate “closed” if you don’t open that particular day. Also, you don’t have to include Saturday and Sunday in your menu if your’e closed on weekends. Use readable text. This is a common mistake often seen in menus as restaurants use tiny or stylish fonts that are basically unreadable. Never make an assumption that customers know what you are selling despite some of them being repeat customers. This is to avoid confusion among customers and makes service faster. Also check these menu design hacks to make customers order more than they should actually be ordering.